English Arts & Crafts copper and brass trimmed pitcher with matching set of six glasses and round tray with heart shaped decoration. 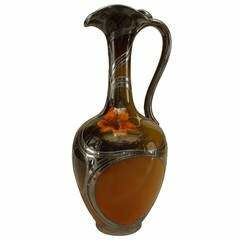 American Mission Rockwood vase/pitcher decorated with flowers and a silver deposit whiplash design. 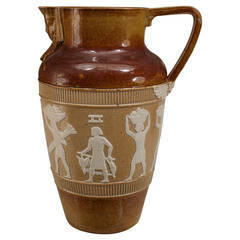 1920's English small brown pitcher with an pharaoh-headed spout sphinx and beige and white classical figures in relief. 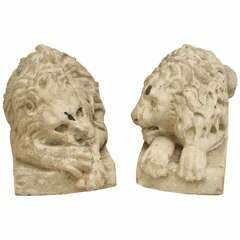 Impressed "Doulton, Lambeth." 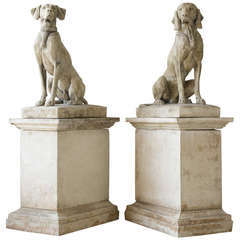 Pair of sculpted dogs in the style of French sculptor Andre Jacquemart in composition stone with custom faux finish. 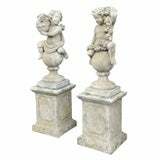 Cast stone putti depicting the flora of summer and the abundant harvest of fall, atop Classic paneled pedestals. 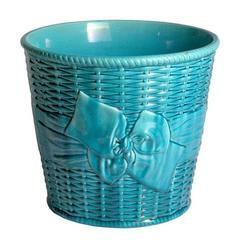 Large Minton Majolica planter in turquoise designed in a basketweave pattern with a large tied bow arround the middle. Impressed: Mintons Pattern #2721 Date Code: 1911.